Greenway Recycling is your partner and support team in your LEED Certified and Recycling projects. Our full scale recycling facility can handle any project you bring our way including the ability to recycle all mixed C&D debris loads. Please contact any of our convenient locations to let us know how we can help you! We are your best and only source in the Carolinas for sheetrock/gypsum wallboard recycling. Please contact Greenway Recycling for more information on this exciting process. We Leave The Hauling To You. We focus on operating C&D facilities and leave the hauling to YOU. We are your partner and not your competitor. 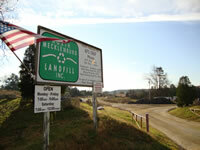 Our facilities’ convenient locations offer fast disposal services. We maintain a clean area for disposal and also provide truck wash stations for your convenience. With over 20 years experience in the construction and demolition (C&D) debris management industry, Greenway Waste Solutions is the local leader with five convenient recycling, reprocessing, and landfilling facilities in the Carolinas to serve your needs. We strive to transform the industry through innovative practices managing C&D debris and a dedication to providing the safest environment possible. Our goal as a company is to further C&D recycling & reprocessing practices that will help lead to a greener and more sustainable Carolinas. Greenway Waste Solutions’s locations are nicknamed "Reclamation Centers" as a catch all for all associated activities: recycling, reprocessing, and landfilling. The locations ONLY accept Construction & Demolition (C&D) debris: NO liquids, NO hazardous waste, NO garbage, and NO asbestos. TIRE & AUTO REPAIR | PROPERTY HOLDINGS & DEVELOPMENT | PINE ISLAND CC © Griffin Brothers Companies. All rights reserved.